“My flower bread…” Lusik says, scattering the lavash delicately on a special cloth on the floor. For 20 years, every morning at 5 a.m. while her village sleeps, smoke rises from the yerdik (an opening in the roof for smoke) and fills Lusik’s tonratoon (the shed which houses a tonir), and in a few minutes the sweet aroma of lavash ride the wind. “Only a lazy person can say that there is no job and sit doing nothing, however, it is not true. There are people in our village who, roughly speaking, do not have even bread to eat, but they do not want to trouble themselves,” says 46-year-old Lusik Grigoryan. Lusik’s family lives in Goght village, Kotayk province (40 km north of Yerevan). In 1990s, when everything was in a mess in the country (Armenia), under the newly formed economic system the family decided to bake bread and sell it. “In the beginning we baked on a machine, but one day the wires of the electricity were cut off, and my husband said, ‘Lusik, can’t you bake lavash in tonir?’ I replied that I would try. Twenty years have passed since that try,” she recalls. In the beginning Lusik herself took her baked lavash to the market to sell it there, but when the number of her clients increased she had to give her lavash to people who later resold it so that she could bake more. Analyzing the past years from an economic aspect, Lusik says that in the beginning she sold lavash directly for 40 drams (about 10 cents) a sheet. Now, re-sellers pay her 100 drams a sheet and re-sell for 120 (about 40 cents). Costs of flour and wood have steadily risen. “Lavash indicates the poor economic condition of our life,” she says. The mild glide of the rolling pin is heard. A dough ball is being rolled out flat under the proportionate pressure of the rolling pin. The woman who works with the rolling pin is Lusik’s sister – Gayane. She skillfully keeps the evenness and flatness of the opened dough, a key part of the lavash process. The rolled out dough dances in Lusik’s hands, after which Lusik stretches it on a rafada (a special handmade board made of thick cloth and straw pulp) and evens the edges of the rolled out dough, sprays a few drops of water and scatters some flour on it, and takes the rafada with the dough to the hot tonir. There must be someone to open and close the lid of tonir to check whether lavash is ready or not, and if yes, take it out with a special iron pole the tip of which is hooked. Usually this job is done by Lusik’s husband – Torgom, but this time he is replaced by his mother – 73-year-old granny Terez. “Bread baking also needs skills, not everyone can bake such lavash. It depends on a person’s talent and hands. There are people whose lavash breaks easily, and they cannot eat it and give the bread to hens,” says Lusik’s mother-in-law. Every Sunday is Lusik’s market day. At 8:00 a.m. she is already in the market, and she usually does not have lavash left in two hours. She sells lavash at 100 drams (30 cents) each; six lavashes make one kilo. 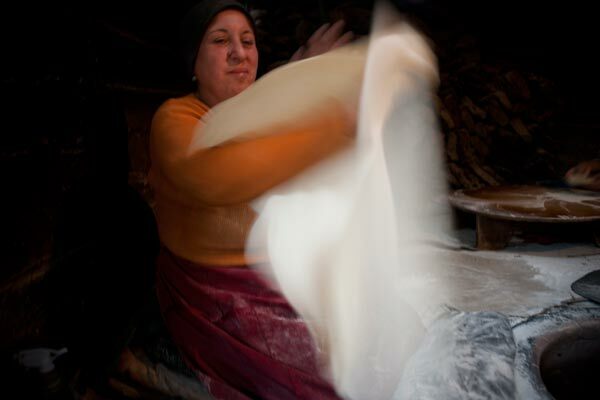 “Traditionally lavash has been baked by women in Armenian families; nevertheless it is a very difficult job to do for a woman - from preparing dough, making balls of them to baking. Simply I earn my living baking lavash,” Lusik says. The woman, who bakes 2,000 lavashes per week, confesses that she has no special secret, she simply does everything properly. “I do not mean to brag, but the number one bread in the bazaar is mine, because everybody asks me what I do, that I have such delicious and pretty lavash. I have no secret, I knead dough properly, make balls of it . . . I work hard, and as a result, I get good bread” she says. The fire disappears gradually, and Lusik lights a new fire. Throwing dry wood into the tonir, she says that they change the clay oven four years, every time paying 30,000 drams (about $90). This is her fourth tonir. It is a work that allows for contemplation in the quiet of the morning, and Lusik thinks about news of the recent mayoral change in Yerevan. She does not want even to hear about the upcoming Parliamentary elections in spring. “No matter what happens I will keep on baking lavash. With difficulty, yet we manage everything, and I am pleased that I can help my children. If I were displeased I would not do this heavy work so long,” says Lusik taking the recurrent flower-bread out of the tonir.